Original program by Eileen Baghoomians and Steven Fawthrop. 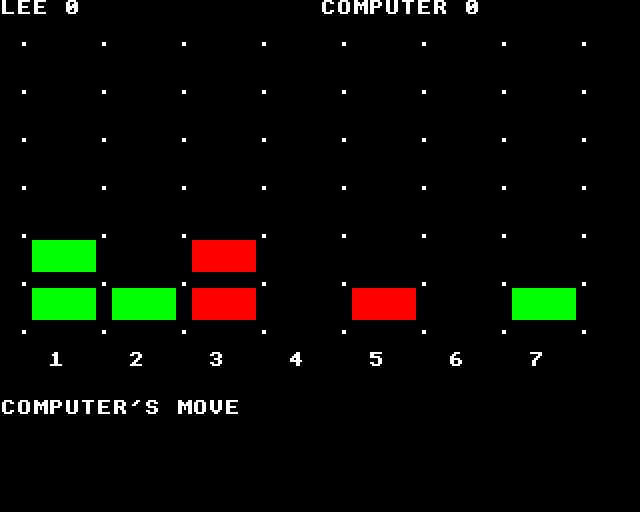 Adapted for the BBC Micro by Paul Borrett. This is an original, colourful game of the Connect 4 and Othello ilk. The game is played on a 7 by 6 grid, with coloured blocks, the object being to place four of your blocks at the corners of a square before your opponent. Blocks may only be placed on top of each other; they cannot hang in mid-air, and the squares formed may be as small of as large as the grid allows. The program allows for one player to try and beat the computer, or for two players to play each other. If you require advice at any time the computer is very kindly programmed to help you - just press 'H'. Users with a 32K BBC B model with disc unit will need to alter the memory position by entering: PAGE=&E00 (RETURN) before typing in the listing.